It usually comes around once per baseball season that I will find a reason to write something about Jim Thome. Sometimes it's actually newsworthy, like if he had just joined a team ready to play the Phillies in the playoffs. But mostly it just has to do with the occasion of him showing up in town or appearing on the cover of a magazine. See, it's easy to write about Jim Thome. It's easy because he's so likable and genuine. He's one of those guys that if you ask him a question, he's going to try as hard as he can to give you a good answer. We were at Shea for a day game in 2003, which was Thome's first season with the Phillies. It was kind of an odd time in team history because the Phillies were supposed to be really good with guys like Pat Burrell and Bobby Abreu coming into their primes along with players like Placido Polanco and Jimmy Rollins solidifying their standings as top-shelf talent. Mix in Thome and Kevin Millwood and the sky was the limit. The problem was the Phillies didn't quite know how to be good. Worse, the manager, Larry Bowa, liked to talk about "winning" as if it were a character trait. He seemed to believe that abrasive behavior and misplaced anger was synonymous with being a leader. He was the exact opposite of Thome because Bowa could never get out of the way of his own ego. Thome was the biggest slugger in the game during the 2003 season and he was practically ego-less. Thome thought mutual respect and a positive attitude were synonymous with being a leader and always seemed to have dozens of teammates following his every move. Nationals go familiar route, but can Werth lead the way? Stick around baseball long enough and you’re bound to hear something new every once in a while. That is the beauty of it, after all. Nothing stays the same, which is good because it chases away the boredom. Still, it was a remarkable thing to hear some of things Roy Halladay said just about a year ago. Halladay just didn’t say it that one time either. Oh yes, the big right-hander made it point to drive home his point that more than anywhere else, he wanted to be in Philadelphia. He was sick of losing. But even Rolen admitted that in order for the Phillies to get to the level they enjoy now where players like Roy Halladay beg to be sent here, he was the one who had to go. See, before the 2002 season then general manager Ed Wade reportedly offered Rolen a deal that he would still be playing out. Oh sure, with Rolen at third base and healthy, the Phillies never would have had David Bell, Wes Helms, Abraham Nunez, Pedro Feliz or Placido Polanco. Chances are they would be trying to find someone take the last few years of the 10-year, $140 million that was said to be offered. See, it was OK that the Phillies had a veritable revolving door at third base because that meant players had changed their minds about going to Philadelphia. Plus, 10-year contract aside, if Rolen had taken the deal, he said. Go to a ballgame. Or hell, go to a movie, a show or the store. Anything. Just go some place where you will be surrounded by people you know. Now when you’re going through the rite of watching a game, shopping, etc., make sure to keep close tabs on the Twins game so that when (if) Big Jim goes deep you can announce it to your friends. Big Jim just hit a home run! After making this declaration, run to a mirror and look at your face because there is a 99.999 percent chance that you will be smiling. Ear to ear, baby. In 20 years of hitting baseballs, Jim Thome has made a lot of people smile. Sure, there is the 589 home runs he’s belted in his career, which is the fifth-most in the asterisk era. Baring a historical hot streak, Thome will join Hank Aaron, Babe Ruth, Willie Mays and Ken Griffey Jr. as the only players to unsuspiciously bash 600 homers, next season. That’s a long shot for this year, however, there weren’t too many people in baseball who thought Big Jim would turn in the type of season he did in 2010. In fact, even though he has played in just 105 games as the DH in his first season with the Minnesota Twins, he should tally a vote or two for AL MVP. Interestingly, Thome’s 25 homers this season are the same as the Yankees’ Alex Rodriguez, and he also leads the AL Central champion Twins in the category. It has been Thome, even more than reigning AL MVP Joe Mauer and 2006 MVP, Justin Morneau, who has most turned the team into a serious World Series contender. But it’s not just the home runs that make people smile. No, that’s barely scratching the surface. Everything about the guy is smile –inducing. Shoot, just say his name… Jim Thome… maybe it ought to replace the word, “cheese,” before pictures get taken. People just love Jim Thome. Actually, they just don’t love him as much as they celebrate him. That’s pretty much a universal sentiment in the baseball world where folks can get pretty jaded and cynical rather quickly. In a business that only goes deeper into the corporate abyss filled with hypocrisy, double standards and a dog-eat-dog mentality, it’s the genuineness of Thome that stands out. And the thing about that is all Big Jim does is subscribe to a theory concerning basic decency. "I really do try hard to be a good teammate," Thome says. "I can't run very fast, but I try to always run hard. I may strike out a lot, but I try to walk to set up the guys who are hitting after me. The other day I didn't score from first on a double. I cost my guy an RBI. I felt terrible about that. I told him, 'Look, I really tried, but I'm old and I'm slow. I hope I can make it up to you in another way.'" Teammates know he is sincere, and they love him for it. No, he can't run. He has played all of eight innings in the field (at first base) since 2007. His defense was the main reason the White Sox decided not to re-sign him. "[Manager] Ozzie [Guillen] wanted flexibility in his lineup," general manager Kenny Williams says. Guillen himself says, "Go ahead, blame me... . But I'll tell you I love Jim Thome. I wish I didn't. I wish I f------ hated the guy. But I can't hate him. Nobody can hate him." Ex-teammates still talk about Thome lovingly in Cleveland (he does get booed a bit by Indians fans, but that's for leaving in the first place) and in Philadelphia and Chicago. He is relentlessly positive. Perkins remembers his first or second day back with the Twins this year after a long stretch in the minors. He was walking by Thome, who was taking his slow, methodical phantom batting practice. "And suddenly, he just stops," Perkins says, "and he smiles and gives me a fist. I mean, it's not like I'm Joe Mauer or Justin Morneau. He barely knows who I am. But that's the kind of guy he is. He's the best teammate I've ever had... . I think everybody thinks that." Thome smiles in his sheepish way when the story is recounted to him. "I think you just want to be a good person," he says. "I'm getting to do what I've wanted to do my whole life. I'm getting to do what millions and millions of people would like to do." Quick story: a few years back when Aaron Rowand was still playing for the Phillies (he was traded for Thome, of course) and holding court in the clubhouse, he told a story about the first time he ever met Big Jim. At the time Rowand was still playing for the White Sox and finally coming into his own as player. So there he was on the field before a game, stretching and doing some calisthenics when suddenly, a man snuck up on him and wrapped him up in a vice-like bear hug. When Rowand finally was let free by Thome, Big Jim launched into a stream of consciousness in which he heaped piles of praise on Rowand. But that wasn’t the part of the story that send folks into a gigantic smile… that comes with the kicker. “I had never even met him before,” Rowand said with a fake incredulousness. And, of course, a gigantic smile. Jim Thome holds out his left hand toward the umpire as he asks for a second to gather himself. He digs his cleats into the dirt, steadies himself. And then, like Robert Redford in The Natural, he points his bat past Thornton, toward the centerfield bleachers. No, really, like Redford. Roy Hobbs was his inspiration. When Thome was a minor leaguer, he could not quite open up his hips when he swung. He was a 13th-round pick of the Indians in 1989; nobody saw all that much in him. His first year in the minors he batted .237 in rookie ball, and he did not hit a single home run. Then—"because I'm the luckiest guy in the world," he says—he happened to run into a hitting guru named Charlie Manuel. Manuel, who was Thome's manager in Triple A, told the kid that he had to open up his hips to power the ball to all fields. Thome tried, but he didn't really know how to do it. "He saw something in me I didn't," Thome says. Manuel kept hammering away at him—open those hips, open 'em up—until finally they were in the clubhouse in Charlotte one day, and they were watching The Natural, and they saw Roy Hobbs point the bat toward the pitcher. "Let's do that," Manuel said. Life is not often like the movies, but the Roy Hobbs gesture worked. It reminded Thome to keep his stance open and to drive the ball to left center. His power emerged. His strikeouts emerged. Jim Thome the slugger emerged. It’s a common rite in baseball circles for players to quietly ask each other for autographs. What happens is one player on an opposing team gives a shiny, new baseball to a clubbie and sends him over to the other clubhouse to have it signed by a certain player. Players love signing those baseballs, too. It’s a huge thrill to sign for another player and a true sign of respect if a peer asks for an autograph (without actually asking). Nevertheless, it’s usually something reserved for the big-time players. Word is Cal Ripken Jr. used to make special time just to sign items from the other team. All opposing team requests had to be made before the series against Baltimore began and Ripken would honor them before the opponent left town. But that was nothing like the one request I actually witnessed with my own two eyes and ears. Sitting with Red Sox old-time legend Johnny Pesky in the home team clubhouse at Fenway Park, ol Mr. Red Sox summoned a clubbie to fetch two brand new balls to have signed by Thome. No big deal, right? Well, when the clubbie returned no more than 10 minutes later with two signed balls from Thome along with two more clean ones with a counter request. “Jim would like you to sign these for him,” the clubbie told Pesky. And Big Jim had just hit another home run. He's 40 now. For a ballplayer, that's the age when everyone officially looks at you as ancient. Age 40 means the end is days away instead of years. Still, based on a conversation with Thome in Clearwater, Fla. this spring, and reiterated in Posnanski’s story, Thome warns that there is still plenty of baseball left for him to play. For now at least, Thome says he isn’t taking one last lap around the track. The 600 homers is looking him right in the face, but it still takes a lot of effort to get his body pieced back together to serve as a big league DH. But you know what, if there was ever a guy who has accepted his place in the game and is the personification of aging gracefully, it’s Thome. Then again, Thome always says things like that. It’s why he’s been beloved wherever he’s played and why everyone will miss him when he’s gone. Can you imagine a World Series in Minnesota? In the first season in an open-air ballpark since leaving the Met for the Metrodome in 1981, the Twins could host Games 3, 4 and 5 of the World Series, which would be played on Oct. 30, 31 and Nov. 1. The average high temperature during the daylight hours in Minneapolis in late October/early November is 40 degrees. With the games slated to start long after the sun goes down, a Minnesota World Series could be quite chilly to say the least. Jim Thome wanted to step out of the batter’s box, wave to the crowd and doff his Twins’ batting helmet to the fans at the Bank on Friday night. As the cheers grew steadily louder as he walked from the visitor’s on-deck circle to the plate, Thome pointed out that the time wasn’t right. Returning to the ballpark he helped open with a home run into the second deck for the first (unofficial) hit with his third different team, Thome wished there was some way he could have acknowledged the Philly fans. But as a pinch hitter in the top of the fifth inning with the game still very much in the balance, it would have been very odd. See, Thome worries about things like respect for the game and the opponent as well as the proper way to play the game. Yes, baseball really matters to Jim Thome. He thought about it again on Saturday night, too, when his two-run home run in the ninth inning started a five-run rally for the Twins that lead to the ugliest loss of the season for the Phillies. This time the ovation for the rocket Thome belted into the second bullpen (estimated at 466-feet) was mostly nostalgic. Sure, it was the future Hall of Famer’s 570th homer and was a shot off the 30th different team, but it was kind of a farewell to his old hometown fans. The standing ovation was a tribute for a guy who got the whole thing started for the Phillies. Would this new golden era of Phillies baseball been possible if Thome hadn’t signed with the Phillies before the 2003 season? When he left Cleveland after 12 years and 334 homers it sparked a resurgence that turned Philadelphia from a place where ballplayers ran from as soon as they could, to a destination. Could the Phillies have gotten Pedro Martinez, Cliff Lee, and Roy Halladay or been able to keep Chase Utley, Jimmy Rollins and Cole Hamels if Thome hadn’t first shown up? Would Charlie Manuel have come to Philly if it hadn’t been for Big Jim? Hell, would Ryan Howard ever been a five-year, $125 million man without Thome? It was a long time coming, too. So if the fans want to give Thome a standing ovation even though he helped the Twins beat the Phillies on Saturday night, it’s OK. For a pretty obvious reason, it felt right. Thome hit his 400th homer at Citizens Bank Park and is closing in on the rare 600-home run plateau. In fact, if Thome gets to 600 he will be just the eighth player to do it (assuming Alex Rodriguez beats him there), but just the fifth slugger to reach the mark having never been linked to performance-enhancing drug use. In other words, there’s no other way to view Thome other than as one of the greatest home run hitters to ever live. Actually, his homer on Saturday very likely could be his last plate appearance in the ballpark he christened with that homer back in 2004. After all, he’s going to turn 40 in August and is pretty much just a pinch hitter and a DH these days. He’s not the threat he once was during his two full seasons with the Phillies—where he hit 89 homers—or the first couple of seasons with the White Sox. But you know what? Thome is cool with all of that. He understands that he has to make some changes and he’s willing to slide into a support role for the Twins’ stars, Joe Mauer and Justin Morneau. Whatever it takes to get another shot at some October baseball, Thome will do what it takes. Yes, the end is creeping ever so closer, and the names Thome passes on the all-time lists get more impressive every time he hits the ball. For instance, home run No. 570 pushed him past Rafael Palmeiro into sole possession of 11th place on the all-time homer list. Harmon Killebrew is just ahead at No. 10 with 573 homers. Plus, with 1,584 RBIs Thome is tied with Killebrew and Rogers Hornsby for 35th all-time. Six more ribbies ties him with Andre Dawson and 11 more equal Mike Schmidt and George Brett. Interestingly, two more seasons could push him past Reggie Jackson for the most strikeouts ever, as well as into the top 5 in walks. Indeed, it’s been a pretty nice career for Big Jim, though he warns there is still plenty of baseball left for him to play. Last weekend very well could have been Thome’s last stop at the Bank, but not his last lap around the track. And where would the Phillies be without him? Probably not where they are now. CLEARWATER, Fla.— It doesn’t matter what it says across the front of the jersey or even what color the whole ensemble is because Jim Thome always looks good in a baseball uniform. For one reason or another, the guy was born to wear the uniform. The Twins makes it a cool 5-for-5 for Thome, who showed up today at Bright House Field in a dark blue uni with grey pinstriped pants, and, of course, those trademarked bloused pants showing just enough sock. You know, old school. Hell, Thome is a ballplayer and he makes any uniform look the way it should. Maybe for Thome it’s enough to leave out the “school” in that last phrase. After all, he’s going to turn 40 in August and is pretty much just a pinch hitter and a DH these days. He’s not the threat he once was during his two full seasons with the Phillies or the first couple of seasons with the White Sox. In fact, Thome has not hit a home run since last Aug. 21 and had just five singles in 22 pinch-hitting appearances with the Dodgers. Even with 564 career homers, there weren’t too many takers for Thome’s services last winter before he caught on with the Twins. But you know what? Thome is cool with all of that. He understands that he has to make some changes. It’s tough to imagine what would have happened to the Phillies if Thome had not left Cleveland before the 2003 season, just as it’s difficult to see how things would have been different had he not been injured during the 2005 season and played out his contract in Philadelphia. Had Thome not been injured it’s pretty reasonable to think that Ryan Howard would have been traded. Nevertheless, don’t write off Thome as simply being a brief exit point until Howard was ready. Not at all. Thome really got the ball rolling for baseball in Philadelphia. He legitimized the notion that the Phillies could be a competitive ballclub in the NL East. Now the end is creeping ever so closer, though Thome warns that there is still plenty of baseball left for him to play. For now at least, Thome says he isn’t taking one last lap around the track. Perhaps two more seasons puts Thome at 600 career home runs, but of course that depends on how many chances he gets to swing the bat for the Twins this season. As it stands now, lefty Jason Kubel is tops on the Twins’ depth chart at DH and he’s coming off a season in which he hit 28 homers and got 103 RBIs. Don’t expect Thome to play much at first base, either. Not only do the Twins have perennial All-Star and the 2006 MVP in Justin Morneau playing there, but also Thome has been at first base four times since leaving the Phillies in 2005. But you know what? Thome has accepted the fact that the Twins’ offense isn’t going to lean on him too much. Call it aging gracefully. Just don’t expect him to go anywhere too soon. Sometimes it’s easy to get excited about the littlest things. Maybe it’s a new episode of a TV show, or a favorite meal. Or it could be a small gift or a short trip to a favorite place. You know what they say—sometimes it’s the small things that matter the most. Sitting there and listening as Roy Halladay was being introduced to us media types during Wednesday’s press conference in Citizens Bank Park, a different feel pervaded. Usually, during such settings it’s not very difficult to get swept up in the emotion. After all, teams usually trot in family members, agents, front-office types and other hangers-on. In rare cases, like Wednesday’s Halladay presser for example, the national cable TV outlets turned out to aim cameras at the proceedings. But when a team introduces its third former Cy Young Award winner since July after trading one away, there’s a tendency to become a little used to big events like introductory press conferences. Think about it—this year the Phillies have added Pedro Martinez, Cliff Lee and Roy Halladay. That’s five Cy Young Awards right there. At the same time, Ryan Howard, Cole Hamels, Charlie Manuel, Jayson Werth and Ruben Amaro Jr. all got new contracts since the Phillies won the World Series. Not to mention, the team signed Placido Polanco, Brad Lidge, Raul Ibanez and, of course, had that little parade down Broad Street. In other words, you can see why it was easy not to get too worked up over Halladay’s arrival. That’s doubly the case considering the Flyers fired a coach and the Sixers welcomed back Allen Iverson within the past two weeks. Add in the facts that the deal for Halladay took three days to come together after Amaro spent the week in Indianapolis denying involvement of anything and it’s easy to get a little jaded. Wait… is Ruben denying he was even in Indianapolis now? That brings us to the grand point—this is the greatest time ever to be a Philadelphia sports fan. Ever. Since 2001, every team but the Flyers have been to the championship round of the playoffs and every team has made gigantic, stop-the-sports-world acquisitions. If the team wants them, they are pretty darned good at getting them. Certainly that wasn’t always the case. A friend’s dad often tells the story about how he and his friends were amazed that a Philadelphia team could get a player like Julius Erving, and I remember watching on TV when Pete Rose signed his four-year, $3.2 million deal with the Phillies. The fact that the Pete Rose signing was on live TV proves how big it was because, a.) there weren’t a whole lot of channels on the dial back then. Just 12 and none of them offered all sports programming. Cable? What? And, b.) I didn’t even live in the Philadelphia region when Rose signed. Hell, I didn’t even live in Pennsylvania. Oh, there were other big deals, too. Like when the Sixers traded Caldwell Jones to get Moses Malone, for instance. But they were few and far between. For every Moses, there was always a Lance Parrish lurking at the podium ready to take questions about how he will deliver the championship. As far as those big moves go, the mid-season trade for Dikembe Mutombo was the first major move for us at the CSNPhilly.com site. We had three people on the staff back then and the trade came down on a snowy February afternoon that kept us cooped up in our little corner of the second floor in the Wachovia Center. Better yet for the Sixers, the deal for Mutombo was one of the few that worked out as designed. Mutombo gave the team the defense and presence in the middle it lacked and made it to the NBA Finals. With Shaq and Kobe in mid dynasty, a trip to the finals for a team like the Sixers was as good as winning it all. Jim Thome’s arrival was bigger yet. Not only was Thome the biggest name on the free-agent market, but also he was a symbol that there were big changes coming. Of course the unforgettable moment of Thome’s first visit to Philly was when he popped out of his limo to sign autographs and pose for pictures with the union guys from I.B.E.W. who held an impromptu rally outside the ballpark to try and sway the slugger to sign with the Phillies. Moreover, Thome’s introductory press conference was memorable because the big fella was reduced to tears when talking about the switch from the Indians. It was a scene that hadn’t been repeated in these parts until Allen Iverson got a bit weepy when talking about his return to Philadelphia. Oh yes, Philadelphia will make a guy cry. Or maybe even do a bunch of sit-ups in the front yard. Maybe in a different era, the acquisition of Roy Halladay would be a bigger deal. Maybe when the contract plays itself out—potentially five years and $100 million—we’ll view it differently. Until then he’s just another big name in a veritable cavalcade of superstars that seem to wind up in our town. The NLCS: Are the Phillies in the Dodgers' heads? LOS ANGELES—Lots of interesting plots and subplots to last night’s Game 1 of the NLCS here at Dodger Stadium. The biggest, of course, was the Phillies’ ability to get clutch hits against the Dodgers’ lefties. Both of the three-run homers and a key double from Ryan Howard came against lefties Clayton Kershaw and George Sherrill. The notable one there was the blast off Sherrill by lefty Raul Ibanez. After all, no lefty had homered off Sherrill in 98 games and nearly two seasons. For a team that went out and got Sherrill specifically to pitch to the Phillies sluggers in late-game playoff situations, Ibanez’s homer was huge. Deeper than that, five of the Phillies’ eight hits in the Game 1 victory were from lefty hitters against lefty pitchers. So it begs the question… are the Phillies in the Dodgers’ heads? Yeah, yeah, it’s only Game 1, but if Pedro were to dial it up in Game 2 and the Phillies go home with a two-game lead and Cliff Lee ready to pitch in chilly and rainy Philly, this one might be over before it gets started. So are the Phillies in the Dodgers’ heads? Certainly based on some of the moves the Dodgers have made it’s not an unreasonable idea. After all, in addition to trading for Sherrill, the Dodgers got Jim Thome to do what Matt Stairs does for the Phillies. In fact, Dodgers’ GM Ned Colletti cited Stairs when talking about the move to bring in Thome. The thing about that is people barely knew Stairs was on the Phillies until he crushed that ridiculously long homer at Dodger Stadium in Game 4 of last year’s NLCS. Reliever Jonathan Broxton has been known to get salty when talking about Stairs’ homer and the Dodgers fans booed Stairs louder than anyone else during the player introductions. So maybe the Phillies are in their heads? We’ll see as the series wears on, but in the meantime Tommy Lasorda (the greatest phony in baseball history according to those in the know), is already chirping. The old Dodger manager was reportedly talking trash about the 1977 NLCS where the Phillies took Game 1 only to lose it in four games. Maybe they can’t. Maybe they’re too wrapped up on what happened last year. • The Phillies are 1-6 all-time in Game 2 of the NLCS. The only Game 2 victory came last year at the Bank against the Dodgers. • The Phillies and Dodgers are meeting for the fifth time in the NLCS, which is tied for the most championship series matchups with the Pirates and Reds. Chances are those two teams won’t be playing each other in the NLCS any time soon. • The Phillies have won 15 of their last 21 games in the NLCS dating back to 1980. • Dodgers manager Joe Torre is making his 14th straight trip to the playoffs. He has not been to the World Series since 2003 and hasn’t won it since 2000. LOS ANGELES — Let’s just put it out there on the line—Dodger Stadium is my favorite ballpark. It isn’t so much about the actual facility as it is what it represents. Of course the reality of how Dodger Stadium was built compared to its ideals of manifest destiny and a veritable garden party don’t exactly mesh, but still… the views! Dodger Stadium is the second oldest ballpark in the National League, but it represents the future. It always has. So we’ll go to Dodger Stadium on Thursday afternoon for the first game of the 2009 NLCS. There’s a pretty good chance that we’ll be back later next week, too, in order to figure out which team will go to the World Series. If the Phillies won the National League at Dodger Stadium last year, why can’t they do it again? Well, they can do it again. After all, in Game 1, Cole Hamels will face 21-year old Clayton Kershaw in a battle of young lefties. The interesting caveat in this matchup is Kershaw is 0-3 with a 6.64 ERA in four starts against the Phillies. Plus, three years ago he was still in high school. Of the teams that he has faced at least twice in his short career, Kershaw is the worst against the Phillies. Take away his win against the Cardinals in Game 3 of the NLDS and Padilla hasn’t pitched seven innings since the middle of July. Besides, that Game 3 was Padilla’s first appearance ever in the playoffs so who’s to know if he can keep his focus long enough to be known a s a big-game pitcher. Hiroki Kuroda is known to the Phillies and not in a good way. Sure, everyone remembers that incident with Shane Victorino during last year’s NLCS, but more telling is that the Phils are 6-for-60 in three games against the Japanese righty. Then there is Randy Wolf, the ex-Phillie who pitched the first-ever game at Citizens Bank Park. Pitching for other teams at the Bank, Wolf is much better than he was as a Phillie. However, Wolf’s playoff debut wasn’t too good and he was pushed out of a Game 1 start to go in Game 4. So it will come down to the bullpens. If the Phillies can get a lead and hold it, they will return to the World Series. But if they let Kershaw, Padilla, Kuroda and Wolf hang around, it could prove to be a tough road for the Phillies. I’m not sure that will happen. That’s why I’m going with the Phillies in five games. Yeah, that goes against the conventional wisdom, but these aren’t the Phillies of yore. These guys know how to win and so they won’t have to return to Southern California until the end of October when they face the Angels in the World Series. Yeah, that’s it—Phillies vs. Angels in the Fall Classic. Can the Phillies repeat? It’s tough, says Dodgers manager Joe Torre who was guided the last team to do it in 1998-2000 with the Yankees. “Well, first off, you’ve got a bulls-eye on your back,” Torre said. “That’s one. Everyone seems to put on their Sunday best to play you. You always get the best pitchers matching up. And then if you have a young pitcher that nobody knows, it seems to be a challenge to that young man to show what they can do against the world champs or those teams. It starts on Thursday afternoon from here in California. For about a week I’ve wanted to write something about Jim Thome and how it just might be worth taking a flyer on the guy for the final month of the season. It was going to be this whole thing very much like how I suggested Barry Bonds might not be a bad pickup last year and how Pedro Martinez might be worth a look this year. You know… trying to stay ahead of the curve. So growing that big hand to pat myself on the back, I knew Pedro would be good a fit for the Phillies even though general manager Ruben Amaro Jr. said the team had no interest in the future Hall of Famer initially. Kudos. Kudos to me, though the Bonds idea was probably a bad one. Anyway, snagging Thome away from the White Sox before the Dodgers got him would have been a good idea. One reason is because he is still playing out the contract he signed when he joined the Phillies before the 2003 season. Another is because with Matt Stairs fighting a two-month hitless slump and Greg Dobbs on the disabled list/in the manager’s doghouse, Charlie Manuel will need another lefty bat for the bench. And who knows, maybe he could play first base if really pressed to it. When the news broke about Thome joining the Dodgers earlier this week, the sentiment from Manuel and ex-Phillie turned Giants’ centerfielder Aaron Rowand was that they hoped the new Dodger was happy. Moreover, both Manuel and Rowand thought Thome would be a huge asset late in games for LA. 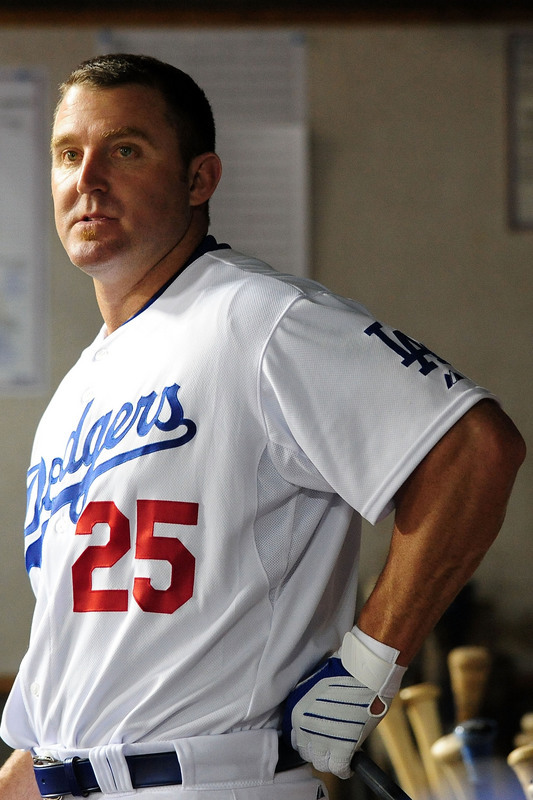 “He brings over 500 career homers off the bench,” Rowand said when asked what Thome gives the Dodgers. Certainly 564 career homers sitting on the bench waiting for a late-game clutch situation isn’t easy to dig up. Plus, in signing Thome it’s obvious the memory of Stairs’ series-changing home run in the eighth inning of Game 4 NLCS still haunts the Dodgers. Besides, pinch hitting isn’t an easy job for young ballplayers. That’s why wily types like Stairs thrive in the role and it’s why Thome might just be a key component for the Dodgers in October. As the former big league pinch hitter Manuel said, seeing a guy like Stairs and Thome lurking in the dugout or on-deck circle drives opposing managers crazy. It makes them do things they normally wouldn’t do and that right there compromises the strategy of the game. “Even if he’s 0-for-20 or 0-for-25, you never know when he’s going to hit one for you to win a game,” Manuel said. So yeah, Thome would have been sweet for the Phillies given the current state of their bench. Sure, Amaro indicates that the team is tapped out in terms of adding to the already-record payroll for the remainder of the season, but hell, the Phillies are already paying Thome. “Similar to the Yankees teams [Dodgers manager Joe] Torre had when [Darryl] Strawberry came off the bench. I think you’re kidding yourself if you’re a manager and he’s sitting on the bench that you don’t think twice before making a move,” Rowand said. “He’s a professional hitter – he doesn’t need four at-bats a day to stay sharp.” Thome on the Dodgers doesn’t guarantee anything, but he is a slight difference maker. It would have been the same deal with the Phillies, too. And on another note, who doesn’t want Jim Thome around? Sure, he’s just a hitter these days and nearing the end of his Hall of Fame career, but man… what a good dude. That should count for something.